Vagos are reasonably robust single wire boat and a good intro to asymmetrics and wiring. Being plastic there is not much to do mainteinance wise and it bounces off most things with little damage. The dacron rig and small kite is definitely for lightweights only or for very windy days when you want to play it safe. Otherwise opt for the mylar main and bigger asymmetric every time. Rigging is quick and easy as is launch and recovery although the boat can feel heavy on a steep slipway or soft sand. Sailing is equally straightforward but to sail it quickly and get it to point high and fast takes a bit of practice and rig tweaking. Usual rules of keeping it flat and not dragging the transom through the water will make for much better progress especially upwind. Whenever possible get out on the wire as it seems to stiffen up the mast and you point better. Once you turn the corner getting the kite up is simple with the single line system and with some skill you can make up for pure downwind speed by being able to sail surprisingly deep. 3 sail reaching is good fun and as long as you can communicate / empathinse with the other person in the boat then there should be no dramas on the wire. Getting the kite down again is also easy but best done on port. The Vago is also versatile. 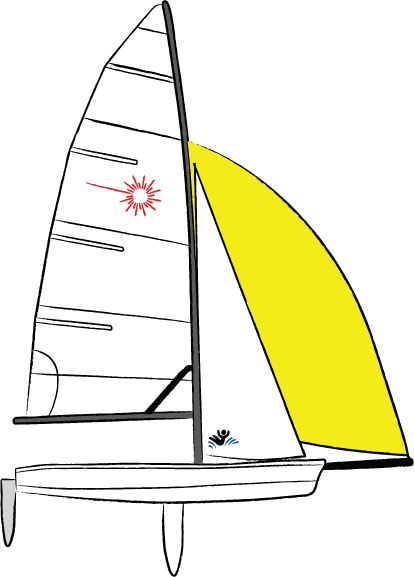 Early teens can sail it easily especially with the small rig. Adults and adult child combos will also have a good time but an all up crew weighing over 150kg will struggle in light airs. You can also single hand it very successfully but a longer tiller extension is required as you will be doing most everything from the wire. Centerboards seem weak and prone to cracking at the top. Rudder blade is huge so learn to make very small adjustments - upside is that you have so much blade in the water you can get away with a lot. If / when you go over they turtle very fast. Let that happen and you will spending quite some time getting upright again especially of you are retrieving a kite in the water. Masthead floats are popular with some for this reason.